Delivering responsive repairs and voids is our core business. Since we were established in 2002, Fortem (formerly Willmott Dixon Support Services) has provided this combined service in people's homes for over 40 social housing clients across the UK. Through our current partnerships, we are annually completing 400,000 repairs in occupied homes whilst preparing 10,000 vacant properties for future occupancy. In addition we undertake repairs nationwide for a wide range of clients and to public sector buildings. Providing a repairs, reporting and diagnostic service through our Smart Hub Contact Centre. Treating the home as our own, arriving on time and utilising our 24/7 multi skilled work force to achieve first time fix where possible. Ensuring we leave tenants completely satisfied and capture customer feedback as part of continuous improvement. A dedicated team of trained specialists who use their operational experience and Active Housing tool to diagnose tenant problems and take the time to fully understand the repair. Our Smart Hub provides: A 24/7 service; Cyclical Maintenance such as gas servicing and repairs management for Birmingham; Additional branch support services to facilitate peaks in demand; Support for new branches with mobilisations to ensure a best-practice driven approach. Reduce out of hours visits by 40% through more effective questioning and diagnostics at the point of contract. Operatives’ van stock is tailored and automatically replenished by our merchant partners to support first-time-fix delivery and customer service, and to reduce non-productive time collecting materials. In our contract with Rotherham MBC, 93% of all repairs are fixed on the same day that the appointment is attended. With Birmingham City Council, we have negotiated a courier service with our suppliers whereby materials that are not available from van stock can be ordered via the operative’s PDA and delivered to the appointment within an hour. To support an East Midlands R&M and voids contract where the client was let down at very short notice by their existing contractor, we stepped in and mobilised a new service in only 36 hours over a weekend. We delivered the service for five months, working together to smoothly transition it in-house in April 2016. To support the successful transition, the client was given full use of Fortem’s processes and IT systems while they established their own. We provide the legally required certification by completing an annual LGSR within the 12 month timeframe. We also provide a periodic electrical inspection report based on landlord requirements and condition. We provide other cyclical maintenance and testing such as Legionella, CO / fire alarms and door entry systems. "Rotherham Metropolitan Borough Council fell victim to poor boiler installation practice during its investment programme to bring properties up to Decent Homes standard. In December 2010, shortly after we had been appointed as the gas service and repairs contract partner for the council, a period of exceptionally cold weather caused the widespread failure of 2,500 central heating boilers, in the days leading up to Christmas. Dozens of Fortem engineers were mobilised and worked through the holiday period to restore heating to thousands of residents." The branch support team has three core functions: operational support, training and reporting. The incoming work is varied, fast-paced and reactive. The team covers inductions, systems training for new and existing staff, creating a suite of reports including the SMART reports and MI branch reports, national branch support which can see the team travelling all over the country, understanding and promoting proactive working, and continuous improvements to the branches and business in general. The SMART reports are created on a monthly basis, providing productivity information down to individual operative level based upon standard minute values, completions, follow-ons, downtime and sickness, jobs which are in progress within individual post code locations, trade types, priorities, workstreams, diary availability and call centre statistics. These reports are shared with clients. One of our clients said that with they were provided with more information in one report than they had received throughout the previous contracts’ duration. In essence, My Home involves placement of the engineer at the heart of our service, providing them with everything they need to deliver exceptional performance, not only operationally but culturally, so that they treat every property that they work in as if it were their own. 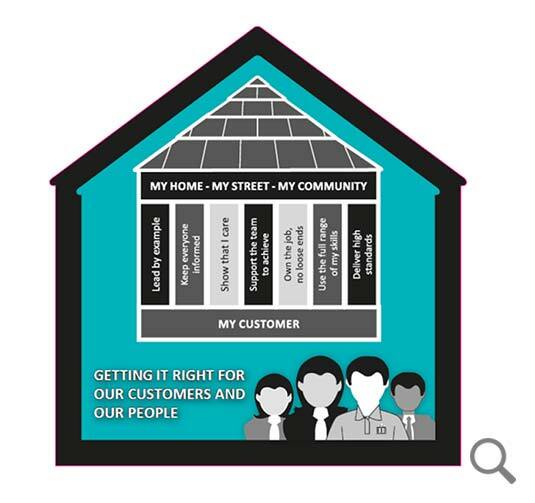 This approach, which aims to reduce follow on work by fixing repairs first time, will deliver exceptional service to customers in their homes, keeping them informed at every stage. I used to get so frustrated when I went to a job to do a patch plaster repair and then had to wait for an electrician to remove sockets, when I knew I could do it myself. With the My Home training, I’m able to get on with the job and provide a better service for our residents. Identifying all the work required to ready the property for the next tenants. Using our multi skilled teams, we complete all of the repairs required to meet with client void specifications. Ensure a successful transition of the home to its new occupier. On all contracts, voids are surveyed and a work schedule created to return the void property to the clients lettings standard. Works schedules are created by our unique void scheduler, housed within our Impact system. Our extensive experience in this field has allowed us to continually develop our processes to remove or at least minimise the impact potential challenges can have on turnaround times. With Birmingham City Council, we undertake pre-vacation visits, enabling us to identify tasks including: clearance/cleansing; scoping and agreeing major component renewals; completing asbestos surveys; coordinating materials; and establishing an efficient resource plan in advance of the void period. This has enabled us to reduce our standard void turnaround from 10 to 6 working days. In order to ensure continuation of performance improvements in our void work teams, we have invested in skill development, including recognised building and maintenance qualifications and job-specific training.